In this episode we talk about Trader Joe’s Uncured Bacon Ganache Bar, Dark Chocolate Covered Honey Grahams with Sea Salt, Salted Caramel Bread Pudding, and a few other new products we’ve seen on shelves. Plus, Russ shares his experience with TJ’s Ghost Chili Grinder. 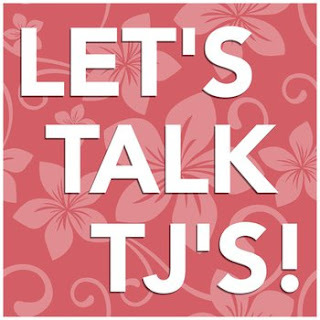 Links to the products we talk about are available at www.letstalktjs.com/4/. Special thanks to Marvo at The Impulsive Buy and thank YOU for listening! I just recently found your podcast and have enjoyed it! I am curious, though, if you've considered making it shorter? They've all been rather long, and I think they'd be stronger as 30-minute episodes. I love podcasts, but there are only a few that really need to be 50-60 minutes. I enjoy hearing you all talk about products, but it does get a little rambly at times. :-) I'd also love it if there were more distinct segments on the show. Anyway, just wanted to give some feedback. Thanks for the podcast! Thanks for listening and thanks for the feedback, Andrea. We'll pass those suggestions along to the podcast gods and see what happens! I tried the Beet Salad you all mentioned tonight. I found it to be seriously lacking in the lettuce department--the salad itself was super yummy but I ran out of lettuce long before the toppings were gone. I'm wondering: have you all had the same experience or did I just pick up a bad one? LOVE the blog! You guys are funny! All three cheeses in that blend are cheeses sold by the block. The toscano comes in multiple flavors, my favorite is the black pepper, I like to grate it over steak and salad. The unexpected cheddar is called that because it is a cheddar parmesan blend… you bite into it thinking it is parmesan, but there is an unexpected cheddar flavor! You should try it by the block mixed into mac and cheese. The beet salad and salsa have been around on the west coast forever, I don’t know about the east coast. The beet salad is a really popular lunch item, I have heard people say they like it because it is “Not a gut buster”, heh. If you come in during the morning at a slow time chances are the employees are going to be bored and have more time to spend with you. Try asking them about their favorite items that are a little less popular, you might just find an oldy but goody you haven’t experienced yet! Also since the new item shelf is for dry goods only, sometimes cold items miss the special attention, so if they aren’t in a flyer its easier for them to go by unnoticed. Now that I don’t work there anymore when I go in I always ask my friends what the best new cold items are. https://en.wikipedia.org/wiki/Scoville_scale Just trying to do a service. Hope no one thinks a ghost pepper is just 10,000 units . . . when it is actually at 1,000, 000 (1 million units).